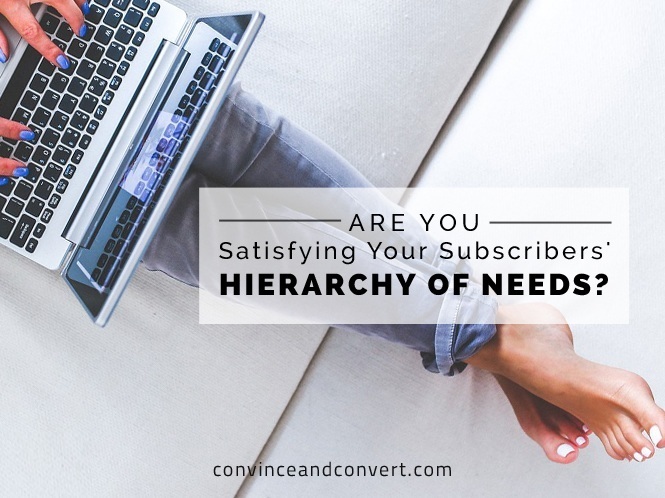 Are You Satisfying Your Subscribers' Hierarchy of Needs? 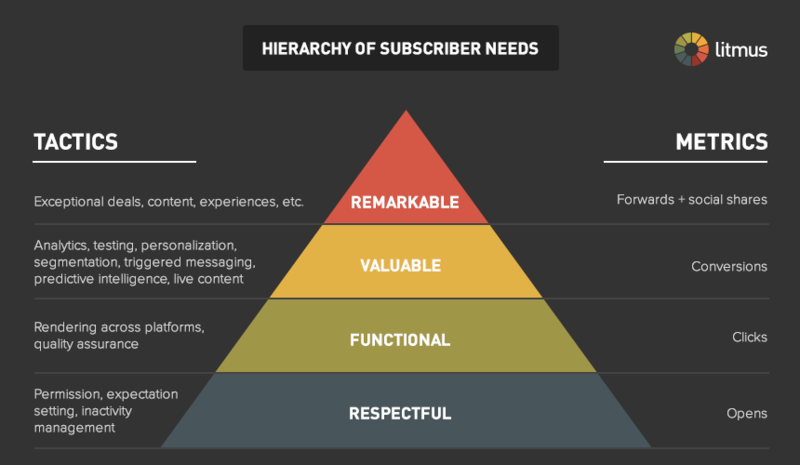 Are You Satisfying Your Subscribers’ Hierarchy of Needs? Expectations are steadily rising in the inbox, and everyone agrees that sending more relevant messages is the key to staying in subscribers’ good graces. However, “relevance” is often talked about in vague, mystical terms or discussed within the narrow context of company-specific examples. Whether you’re meeting each of these needs can be gauged by measuring common email activities: opens, clicks, conversions, and forwards. Let’s take a look at each subscriber need in turn. At the lowest level, subscribers need marketers to respect their permission grant. At the beginning of the email relationship, that means marketers should ensure that every person is aware that they are opting in to receive email—whether they’re using a passive or active opt-in, and whether they’re confirming that opt-in in the inbox with an opt-in confirmation request email or not. It also means setting the appropriate expectations around email frequency and content. And at the end of the email relationship, it means an easy and quick unsubscribe process, as well as having a system in place to manage inactive subscribers. If a subscriber hasn’t opened or clicked on one of your emails in a long time, marketers need to acknowledge that permission has been withdrawn and stop mailing that person. Respect and trust are the foundations of all business relationships. They are the foundation of email relationships as well. While some think that a relevant message can compensate for a lack of permission, this is a losing strategy, as permission is foundational to creating relevance. The email element that has the biggest impact on whether an email is opened is the “from” name, which represents the person’s previous interactions with your emails and your brand in general. Disregarding permission puts your brand at an immediate disadvantage in the inbox, in addition to risking sender reputation damage and brand damage through negative word of mouth. You can measure how respectful your emails are by looking at opens, as well as spam complaints. A lack of opens early in an email relationship likely indicates that you never really secured permission in the first place, and a lack of opens later likely indicates that permission has lapsed. Emails render appropriately across the mobile, web, and desktop email clients that your subscribers primarily use. Text is legible and links are spaced far enough apart so they can be accurately clicked or, more importantly, tapped. The links in your emails take them to the intended destination. The content is clear and free of errors. Any special email functionality has a good fallback for when that functionality isn’t supported by a particular email client. Essentially, all of this is about quality assurance. As in other forms of communications, people are easily distracted by errors—which is especially detrimental to emails since you only have a few seconds to capture a subscriber’s attention. If they focus on an error in rendering instead of your message, for instance, then engagement suffers. And if they’re motivated enough to click through and then find themselves on an unexpected landing page or encounter a “404 page not found” error, then they’re less likely to click through in the future. Rendering, in particular, is a challenge because there are no standards for email coding support, unlike web coding. CSS coding that works in Apple Mail may not work in Outlook 365 or Gmail, for instance. Migrating to mobile-friendly email designs has been a struggle. According to just-released joint research between Litmus and Salesforce, only 56% of major B2C brands are using either responsive or mobile-aware email designs for their promotional emails, despite the fact than the majority of emails are now read on mobile devices. Additionally, the number of devices that can display emails is growing—and becoming more challenging as well. For example, after years of contending with the small screens of smartphones, marketers now get to wrestle with optimizing their emails for the downright tiny screen of the Apple iWatch, which recognizes a new version of HTML: watch-HTML. You can measure how functional your emails are by looking primarily at clicks. If your emails have broken links and images or have text that’s too small to read on mobile devices, for example, your clicks will suffer. In order for marketers to have profitable relationships with subscribers, they have to create valuable experiences for them. Whether it’s in the form of deals, news, alerts, or some other kind of content, subscribers must find your emails useful. Thankfully, marketers now have many tools at their disposal to create valuable experiences. Generally speaking, basic analytics can help you determine the preferences of your overall audience, and A/B testing can help determine how best to communicate with your subscribers as a whole. But the most exciting tools are ones that get us closer to the 1-to-1 marketing paradigm. Advanced analytics can power sophisticated segmentation, dynamic content, personalization, and product and content recommendations. And marketing automation and triggered messaging can deliver the right content to the right person at the right time. You can measure how valuable your emails are by looking primarily at email conversions and revenue. This is the point in the Hierarchy of Subscriber Needs where marketers often go wrong. Because of confusion, poor goal-setting, technical roadblocks, and other issues, marketers will use top-of-the-funnel metrics instead of bottom-of-the-funnel metrics. For instance, some marketers measure the success of subject lines by opens instead of conversions, leading to “winning” subject lines that sometimes maximize opens at the expense of conversions. Similarly, some content marketing efforts are measured entirely on clicks and web traffic instead of demanding that content at least partially contribute to conversions. Also, for privacy or security reasons, many brands don’t feed conversion data back to their email service providers, depriving those systems of key data that would help them help clients make better business decisions. And lastly, subscribers need the emails they receive to at least occasionally deliver remarkable experiences—that is, something that’s worth telling someone else about. People are social beings and want to be in a position to share high-value information with their friends, family members, coworkers, and colleagues before anyone else. They want to evangelize for your brand, but you have to give them something worth sharing—be it an amazing deal, exclusive content, or a special experience. Targeting niche audiences with segmentation and triggered messages. Making the most of topics such as events and charity efforts, which are innately more share-worthy. Planning periodic emails with extra-special content and using design to differentiate those emails from your run-of-the-mill emails. Placing prominent “share with your network” calls-to-actions in your most share-worthy emails, as these links also increase forward rates. You can measure how remarkable your emails are by looking primarily at forwards and social shares. In addition to raising awareness, aiding acquisition, boosting email engagement, and generating additional conversions, forwards are powerful indicators of the overall health of your email program. Used to measure the topmost portion of Hierarchy of Subscriber Needs pyramid, forwards are a sign that you’re fulfilling your subscribers’ needs at the highest level—that your emails are not just relevant, but deeply relevant. An email program can be modestly successful while only fulfilling the first three subscriber needs, but a program can never be highly successful if it isn’t creating remarkable experiences that turn subscribers into evangelists. We recommend tracking your forward-to-open rate as a barometer of email program health. If your monthly forward-to-open rate is in the bottom quartile—that is, less than 0.11%—then that’s likely a sign that your email program is not meeting this need. As a consequence, you may find that the engagement of your new subscribers falls off quickly, you’re managing a high level of inactive subscribers, and the lifetime value of your subscribers is low. How well is your email program fulfilling each of the four subscriber needs?